Q&A on sugary beverages by Lisa Goldberg Keithley, M.D. Q: Kids love sweet drinks. What’s wrong with that? A: Many children’s drinks are loaded with added sugar and have little nutritional value. According to the CDC, sugary beverages are a main factor in the rise of childhood obesity. And kids who consume a lot of sweet drinks may not be getting enough vitamins, calcium and other nutrients. Q: How much sugar should kids get each day? A: Most kids consume too much sugar. The American Heart Association recommends they get no more than 3 teaspoons of sugar per day, but kids ages 4-8 typically consume 21 teaspoons per day. 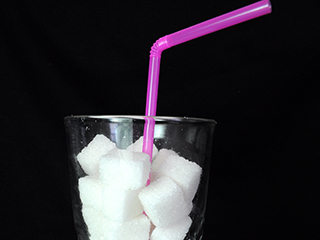 Q: Do some children’s drinks have too much sugar? Hi-C®: This longtime favorite is low in fruit juice ─ just 10% ─ but is high in added sugar. One 6.75-ounce carton has 6 teaspoons of sugar. That’s more sugar per ounce than in a regular Coke. Hawaiian Punch®: Not much juice in this drink ─ only 5% ─ but 8 ounces contain 4 teaspoons of sugar. SunnyD®: It may look like orange juice, but it’s really only 5% juice. A 6.75-ounce bottle has almost 3 teaspoons of sugar. Capri Sun®: One little 6-ounce pouch has a big 4 teaspoons of added sugar. Sodas: A 12-ounce can of regular Coke® contains almost 10 teaspoons of sugar. That’s more than three times the recommended daily allowance of sugar in just one drink! Q: If sweet drinks are a bad choice, what’s the alternative? Wonderful water: Water is the ultimate thirst quencher and contains no sugar or calories. The Institute of Medicine recommends that kids ages 4-8 get about 5 12-ounce glasses of water each day. Older kids and teens should get 5-8 glasses. Marvelous milk: Milk is rich in nutrients, such as calcium, vitamin D, and potassium, which are important for healthy bones and preventing cardiovascular disease and type 2 diabetes. The American Academy of Pediatrics recommends kids ages 2-5 drink 2 cups of milk daily. However, too much milk can lower the body’s iron stores. And remember, juice shouldn’t replace eating apples, oranges, grapes and other fruits — which are an important and nutritious part of a child’s diet. Dr. Keithley practices in MPCP’s Arnold office. 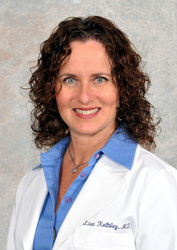 She received her medical degree from Drexel University College of Medicine, and completed her residency program in Family Practice at Chestnut Hill Hospital. She is certified by the American Board of Family Practice. Caregivers need to live by this rule: Take care of yourself first or you will not be able to help the person who needs assistance.